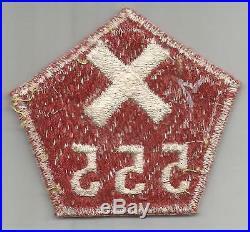 WW 2 US Army 555th Engineer Brigade Patch Inv# A451. This is for the item stated in the title and pictured. Please use image super sizer for the best view. You get the item pictured, we do not use stock photos or other sellers images. Pay for the item within 3 days of invoice. Get Images that Make Supersized Seem Small. Auctiva's Listing Templates improve your auctions in minutes. Attention Sellers - Get Templates Image Hosting, Scheduling at Auctiva. 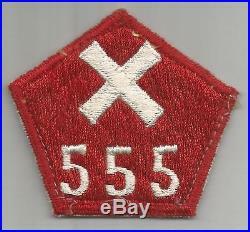 The item "WW 2 US Army 555th Engineer Brigade Patch Inv# A451" is in sale since Saturday, May 26, 2018. This item is in the category "Collectibles\Militaria\WW II (1939-45)\Original Period Items\United States\Patches". The seller is "worldwarpatches" and is located in Sierra Vista, Arizona.